In our house we love bath time. It's a great way to calm the kids down and have some quiet play time before bed. I'd been meaning to invest in some new bath toys as Logan's had some of his for years now and they really just need throwing out as they're done. Luckily for Logan and Harlow Munchkin got in touch and asked if we'd like to review some of their cool bath toys, and of course I happily accepted. Here's how Munchkin describe themselves: "Munchkin develops clever, innovative products for babies and children that anticipate and serve parents’ needs by thinking of “the little things.” Founded in 1991 in Los Angeles, California, Munchkin now has 7 offices worldwide. We are passionate, creative, and believe in only making the best products that are trusted and effective. We invite you to explore our website and help us rid the world of all things mundane!" Munchkin products certainly aren't mundane and my two didn't think so anyway, especially Logan when he spotted the bath toys we'd been sent to review. We received The Scooper Hooper, Swimming Scuba Buddy and Squirtin' Farmyard Friends toys. 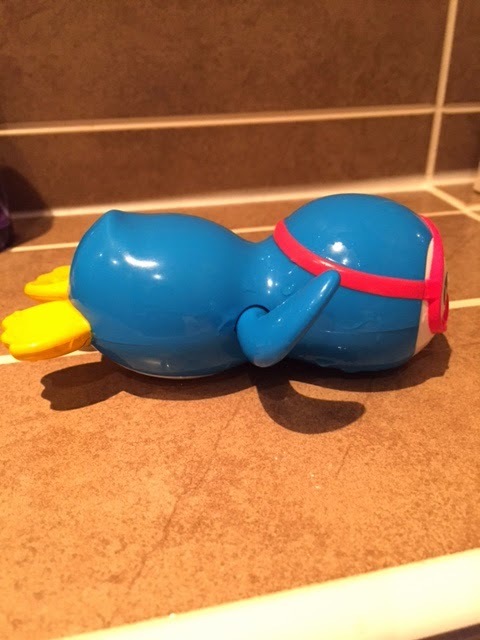 This bath toy is for 12 months + and has two uses really. As the name suggests you can use it as a 'scooper' i.e. scooping the balls out of the water like a fishing net as the netting is closed or 'hooper' as in similar to playing basket ball but the balls stay in the net instead of dropping through. 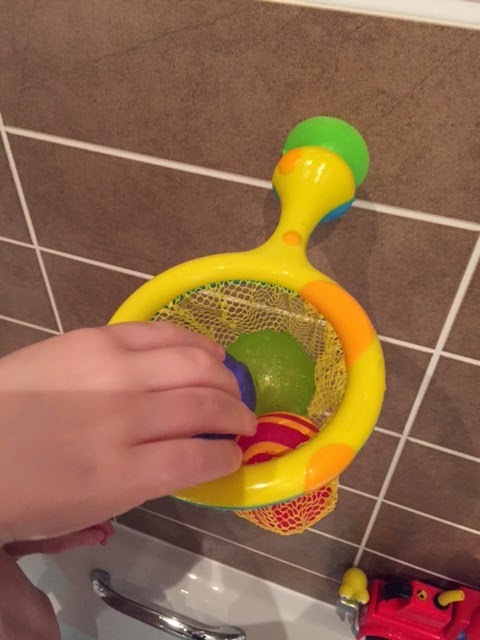 To play with this toy as a ball and hoop you simply stick the end of the handle to your bathroom tiles using the handy fixed green suction cup. It's quite a big suction cup and holds really well. Logan managed to attach it to the tiles himself and had to exert a little bit of force whilst trying to remove it so thumbs up for staying stuck. 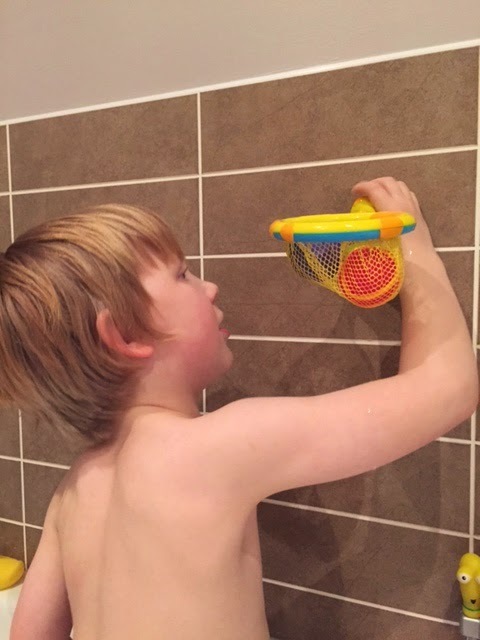 So many bath toys with suction cups stick but eventually fall which is very frustrating when your child is trying to play a game, I'm glad to say this hasn't happened with The Scooper Hooper. This was the toy that Logan spotted first. I'm not entirely sure why but it may be because it's blue and blue is his favourite colour. The Swimming Scuba Buddy is for 9 months + and is designed in the shape of a cute swimming penguin who has a little diving mask/ goggles over his eyes. He has little yellow feet at the back of his body and in the middle is his flippers and that's where the action happens. To make the Swimming Scuba Buddy swim you hold his feet at the back with one hand and turn his flippers anti-clockwise with the other hand, place him in the water, let go of his flippers and away he goes. This little guy actually swims really well and quite fast through the water. Logan loved it and was able to use the toy himself and Harlow really enjoyed watching. I found that this wind up toy was easy to dry off as well after being used in the bath. I basically just gave it a shake to get rid of any excess water then placed on the side of the bath to dry out. 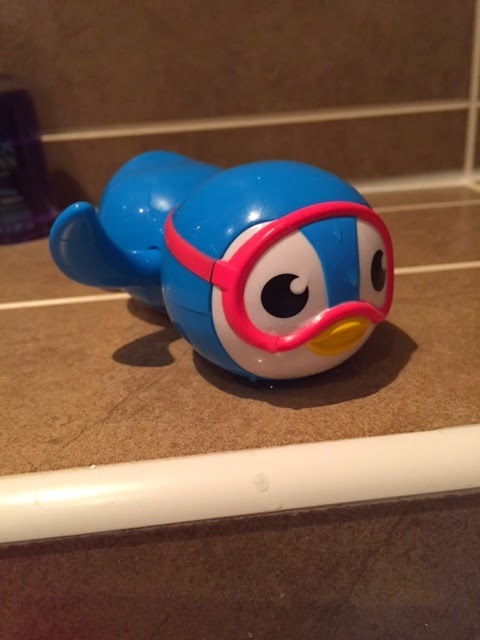 The next night when I was getting the kids ready for bath time again I checked the Swimming Scuba Buddy and was pleasantly surprised to find him bone dry. I hate bath toys that retain bath water in any shape or form as it doesn't feel clean to me. 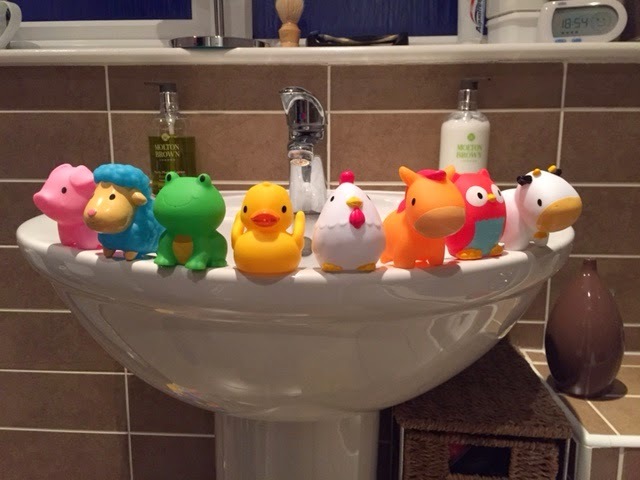 Every child loves a squirty bath toy and the Squirtin' Farmyard Friends do just that, squirt water. They're designed for 9 months + but I'm sure younger children would like them just as much as older children. I know Harlow took an interest in the bright colours and liked to have water squirted on her tummy from them. Logan enjoyed them just as much and it gave him a chance to interact with his baby sister in the bath. You get 8 different farmyard animals in this pack for RRP £9.99. There's a pink pig, blue sheep, green frog, yellow duck, white chicken, orange horse, red owl and white & black cow. You can get a smaller pack of 4 animals (chicken, sheep, cow & pig) for RRP £5.99 but I like the variety in the 8 pack. 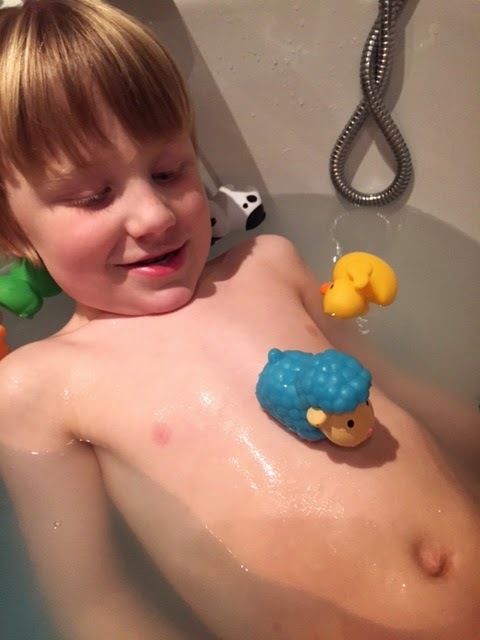 These Squirtin's Farmyard Friends are great, they're very colourful, easy to squish to take on water (easier than The Scooper Hooper balls) and dry out nicely when bath time is over and all the water is squeezed out of them. Logan's had a munch on these too however none of the colouring has been affected. They're also fab for younger children when trying to teach them about farm animals and the noises they make. You could even sing Old MacDonald Had a Farm if you wanted too. 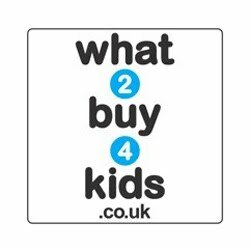 Overall these are lovely bath toy products for you little ones and are sure to keep them occupied and happy while you flutter around trying to wash them. Pricing all seems fair to me and these toys can be purchased directly from the Munchkin website. 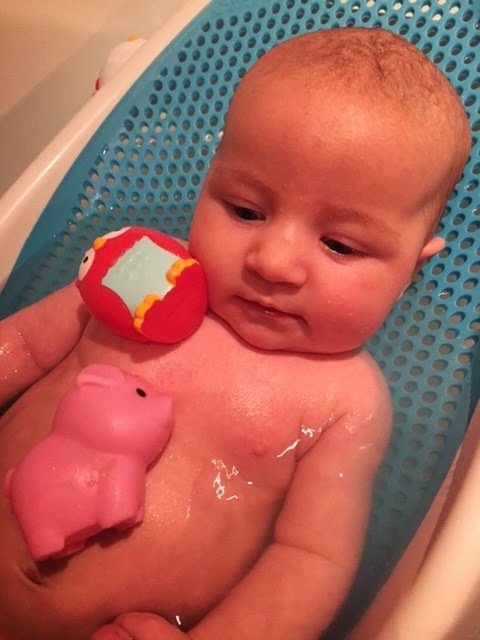 We really enjoyed these bath toys even though Logan is 5 years old and Harlow is 10 weeks old, they both still got a lot out of them in their own way. Logan preferred the Swimming Scuba Buddy and got bored of the other toys quicker and Harlow enjoyed looking at everything really. I'm sure once she starts to grasp things she'll enjoy them even more. It was a shame that the paint on the feet of the Swimming Scuba Buddy started to peel a bit when Logan put it in his mouth, that was the only real down side to the toy but apart from that he loved it. 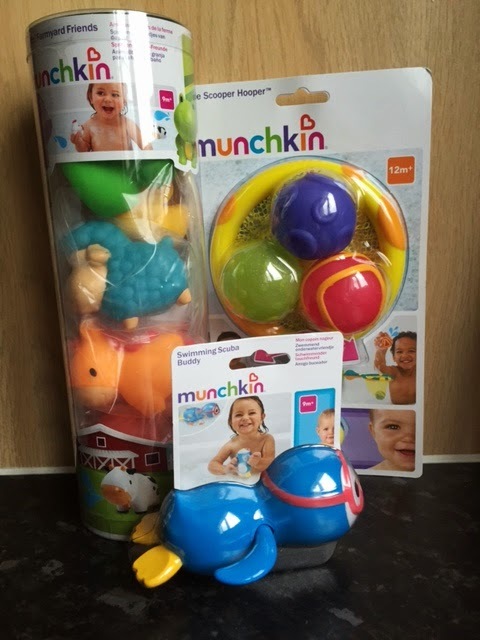 Please visit www.munchkin.com/uk/ for more products and information. You can also see what Munchkin get up to on Facebook and Twitter so why not pop over and say hello! I was provided with one set of each of these toys in order for me to conduct this review. All opinions are my own. 3 comments on "Review: Munchkin Bath Toys"
Looks like fun! Crazy how there is so many different bath products out there! We've got the squirting animals too and Baby L (7.5 months) seems to like them...well, eating them!